The high profile event brought together INTO staff, university partners and many of our global recruitment partners. With 130 meetings, planning sessions and training workshops taking place alongside a finance conference and global leadership meetings, this year’s GRC packed even more into its five-day schedule than in previous years. Before the hard work officially started, delegates were able to enjoy the traditional Thai light festival of Loy Krathong. 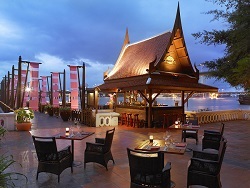 From the Anantara Resort’s prime riverfront location, attendees watched firework displays, Chinese lanterns being released and neon-lit barges pass by. Global Recruitment Director Steven Smale opened the conference, reflecting on another challenging year, before focusing on the forthcoming days and next year’s activities, bringing into play the theme of the conference: INTO the Future. The GRC focuses not only on planning for next year and beyond, but also provides a valuable opportunity for globally dispersed INTO staff and partners to meet up and strengthen relationships, he said. In many parts of the world, eight is a lucky number. Now eight years old, INTO’s achievements are not down to luck, but to the hard work of a global community, transforming students’ lives and getting students into high-quality Higher Education. Jeremy Lindley, Managing Director of INTO Europe, reinforced the success story: pointing out the fact that academic enrolments continue to grow, personal endorsements are increasing, and all universities that have relationships with INTO are going up in the league tables. A similar picture was painted in the US, where enrolments have increased for the seventh year. In an energetic speech, Glen Besterfield, Centre Director of INTO University of South Florida, adapted several famous quotes, including one of Sir Isaac Newton’s: “If I have seen further it is by standing on the shoulders of giants,” claiming INTO were the giants. Presentations from INTO China and partner universities followed. A busy first day was rounded off with a drinks reception followed by a cruise along the Chao Phraya River. After passing Bangkok’s Grand Palace and several beautifully illuminated wats, the GRC Awards Ceremony took place, where staff and teams were recognised for their achievements over the past year. The second hot day saw delegates seek air-conditioned sanctuary in an exciting variety of workshops. An informative, interactive session led by Tim O’Brien, INTO’s Director of Knowledge, provided participants with details of what sets INTO apart from its competitors, and sparked new ideas for INTO’s future. The busy schedule continued after the end of day two’s workshops, with a cocktail reception and dinner held for recruitment partners. For other delegates, there was a chance for sanuk (fun) with the option of attending a Thai boxing match or participating in a tennis tournament. Only two days have passed, yet so much has already been covered. Come the end of the week, delegates will have strengthened relationships, made new contacts and formulated new ways of working even more closely together to build upon INTO’s achievements.